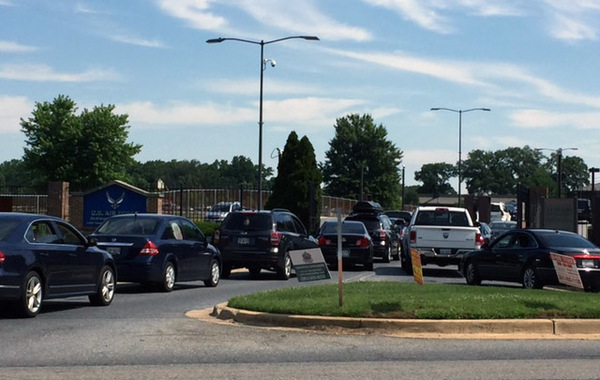 Joint Base Andrews was locked down for more than an hour Thursday morning after a report of an active shooter at a base medical facility turned out to be a false alarm. WASHINGTON — Joint Base Andrews was locked down for 1.5 hours Thursday morning after a report of an active shooter at a medical facility there turned out to be a false alarm as the base was about to begin a security drill. All buildings were cleared about 10:40 a.m. and the base posted on its official Twitter account that there was no threat. Base officials did not answer questions from reporters who gathered at the main gate, instead officials tweeted some details about what led to the lockdown. "This was a drill that was going on that was mistaken for a real event," said Defense Sec. Ash Carter during an unrelated event to discuss transgender service members. Carter said military officials must figure out how to reduce the chances of such false alarms during security drills because it has happened before. A "no-notice" active shooter drill was planned for Thursday morning on what officials described as "the opposite side of the base," the base reported on Twitter. "Reports of a real-world active shooter situation at the medical facility were miscommunicated before the exercise was able to begin," the base said on Twitter. Base officials also said there was a "misidentification of the security forces emergency services team who were conducting a routine inspection of the facility." The base's commander Col. Brad Hoagland said there was no threat to the base. "We take all threats seriously and reacted to ensure the security of those on the base," Hoagland said. Base officials received the active-shooter report about 9 a.m. Thursday at the Malcolm Grow Medical Facility on the base. All personnel were directed to shelter in place at that time. Sources tell NBC News justice correspondent Pete Williams that someone inside the medical center saw two men involved in the drill armed with rifles, which are not normally seen on the base. The person who spotted the armed men was unaware of the planned drill and called 911. The emergency call was routed to Prince George's County, which then alerted the base. Flights were held during the lockdown and the medical center was evacuated, Williams said. The base relied on social media to share updates during the ordeal. A comment on the base's Facebook page asked whether the lockdown was related to a drill that was scheduled for Thursday morning. But the base responded, "We are responding to a real world report of an active shooter. We take this types [sic] of reports seriously and are responding accordingly to ensure the safety of those on base." At 10 a.m., the base tweeted, "Due to the serious nature of this report, the base is reacting to ensure the safety of all personnel." The base is home to Air Force One. According to The Associated Press, Vice President Joe Biden was scheduled to leave from Andrews on Thursday morning, but his trip was delayed by the lockdown. The vice president's office said he was waiting out the delay at his residence at the Naval Observatory in Northwest D.C. Emergency vehicles in the area of the base had on lights, but no sirens. At least three people in camouflage and helmets could be seen walking working dogs around the three-story building. During the lockdown, a few people could be seen walking out of the building, including a person being moved in a wheelchair. Helicopters hovered overhead, but it was unclear if they belonged to news organizations or the military. WTOP's Neal Augenstein said about 100 cars lined Dower House Road waiting to be let into the closed gate before the all-clear was given. Guards in green fatigues allowed some vehicles to enter the gate however. Within minutes of the gates opening, the vehicle traffic dissipated and there was no sign that anything had happened. 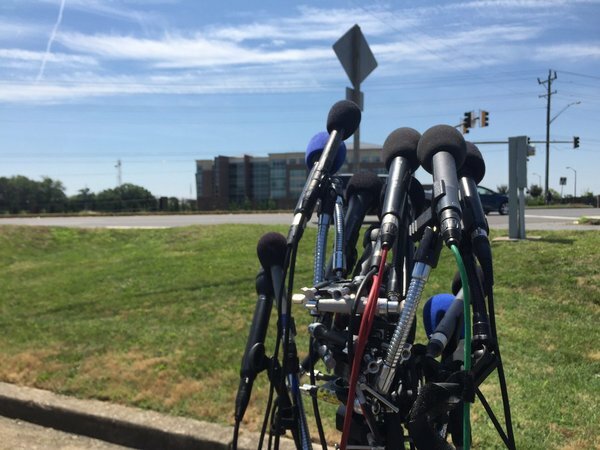 Last October, an office worker misunderstood a notice advising staff of an upcoming active shooter drill, which resulted in a massive police response to a building that houses a defense contractor in Bailey's Crossroads in Fairfax County, Virginia. CBS News and WTOP's Amanda Iacone contribute to this report.